I spent a little bit of time going through craft supplies today, but I spent most of my free time working on Alison's waffle stitch afghan. Today I finished the second ball of yarn... only six more to go! 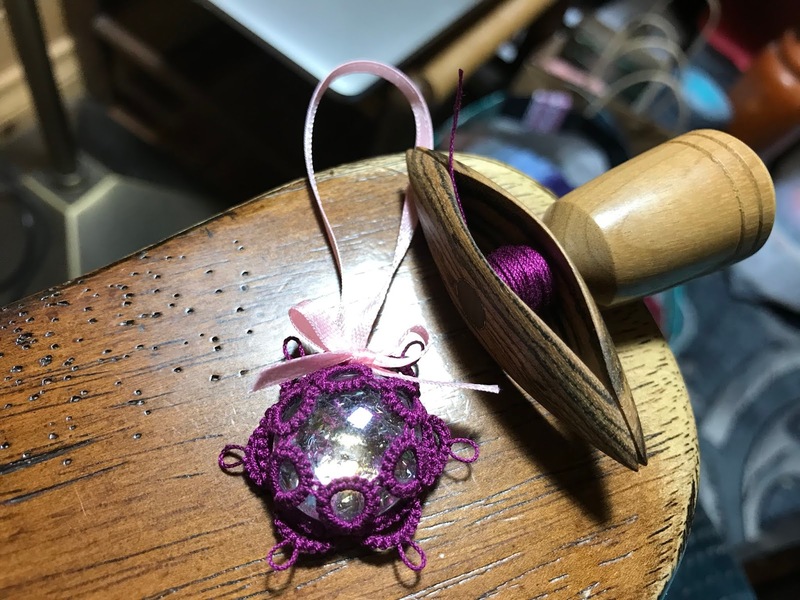 My day wouldn't be complete without an Ice Drop, so I opened up a package of Lizbeth Boysenberry Dk and tatted the basic pattern. The basic pattern still makes me happy! 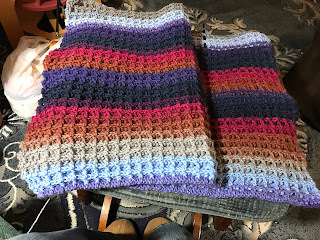 Variegated yarn is perfect for the blanket. Love the Boysenberry! This is another colorway of Mandala. It works so much better in a blanket! The afghan waffle blanket is looking great. Thanks, Jane! I'm kind of addicted to this stitch. It's so simple to crochet, but it looks and feels like it must be complicated! Lovely rich colour for the ice drop. Puzzled by the wooden shuttle/handle. I do like the Boysenberry Dk. The handle on the shuttle is to give you something to grasp while winding on thread. It screws off for tatting, and it has a little jump ring on the end so that it can be worn as a pendant. If you combined the two as a pedant, you would never forget your tatting!!!!!!! Thanks, Sue! If I don't keep busy, I'll never use up my stash!